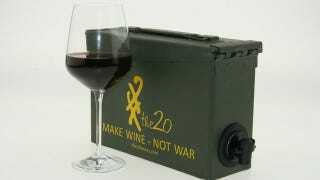 If you've got bulletproof tolerance, wine-in-a-bag-in-a-box is a beautiful thing. It's cheap, portable intoxication. But that cardboard won't make the cut when the Tour de Franzia gets a little more...COMBATIVE. You want your wine protected.